One of the most enjoyable things at the Durga Puja festivals is the community dinner. Sitting together and having a nice meal with the rest of the community gives a great feeling of solidarity. But these dinners are also a source of major logistical issues. Switching gracefully from the dinner to the cultural programs becomes a major problem. People trickle in at the dinner hall at their own pace, while the events start on the main stage. Many people, in the great urge to enjoy the events of their favorite artists, are tempted to bring in their dinner inside the auditorium and enjoy the food as well as the performance. And this, as usual, causes a major problem. All auditoriums forbid bringing any food or drink inside the hall. But we still manage to sneak in some, maybe some snacks, or a cup of tea, or a can of soda. At the end of the show, when all the happy audiences have left, the organizers find themselves in a big mess of trash – spilt coffee, decaying food, foam cups, dirty napkins, crushed soda cans. Under the angry eyes of the hall authorities threatening to impose severe fines and ban the organization of using the facility in the future years, the festival organizing committee members get to work to clean the premises. I understand, that sometimes, food becomes necessary – maybe for a hungry child, or maybe to take some prasad for the member of the family who had to stay home, or maybe that hot cup of tea which doubly enhances the enjoyment of that nostalgic song. But please, think about the consequences of such actions. 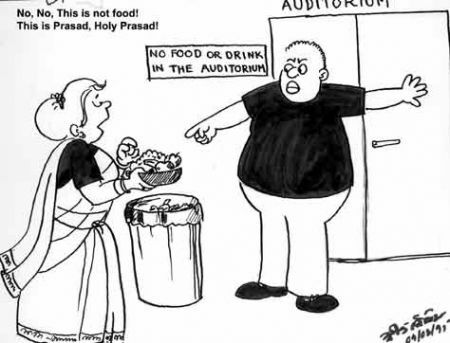 Keep the food and drinks outside the auditorium, please help in keeping the facility clean. Lets all enjoy the Pujas without any incidents that can cause any unnecessary strains. This entry was posted in Cartoons, Generic, Social and tagged community, dinner, Durga Puja, festival, New Jersey by sudipta. Bookmark the permalink.